The Cleveland Monsters have had an up-and-down season in 2016-17. Being one of the youngest teams in the AHL coupled with a new head coach meant the team had a learning curve to start the season. Now that they’ve had 38 games together, you can see the chemistry they’ve developed. They’re not getting the results they necessarily want, but a closer look at the team suggests some good things are happening. A look at their last two games puts their season into perspective. On Friday, the Monsters defeated the Rockford Icehogs 2-0. Brad Thiessen stopped all 32 shots to earn the shutout. 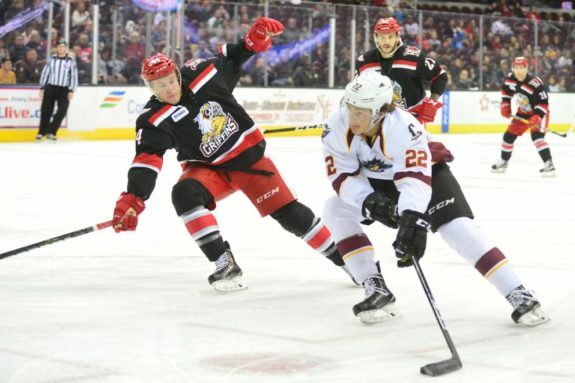 Then on Saturday, the Monsters couldn’t get anything going against the Grand Rapids Griffins, losing 5-0. A good game, followed by a bad game, has been the recent theme. Overall, they started poorly. Then they strung together a lengthy point streak. The result is an 18-16-1-3 record, good for fourth in the division and 10th in the Western Conference. So the Monsters sit in the middle of the pack in their division. One of the reasons for this is their struggling offense. As of this writing, the Monsters have 96 goals in 38 games, last in the AHL. Again, this isn’t much of a surprise when you consider the youth of the team and other factors. Oliver Bjorkstrand, Sonny Milano and Markus Hannikainen have spent parts of the season in Columbus. Daniel Zaar is expected to miss another 2-3 weeks with an upper-body injury. The team should rebound once everyone is back in the lineup. There is good news. The Monsters were 10th in goals against as of this writing. They are preventing goals thanks to All-Star goalie Anton Forsberg. Forsberg is 12-8-2 with a 2.22 goals against and a .928 save percentage. He is the reason that the Monsters are in the middle of the pack instead of the basement. Speaking of Milano and Bjorkstrand, how are they doing with the Monsters? Milano has 9-11-20 point total in 30 games while Bjorkstrand has 11-6-17 points in 28 games. Upon first glance, this seems low for these top prospects. After viewing them on Friday against Rockford, I’m not concerned about that. I’m more encouraged than ever. Milano was a stud on Friday against Rockford. His line with Justin Scott and Jordan Maletta was the best line on the ice for both teams. They were fast, confident and aggressive all night. They created the game’s first goal thanks to a perfectly executed odd-man rush. Milano dished the puck to Scott, who found Blake Siebenaler who beat Jeff Glass to make the score 1-0. Milano started the rush, then made a great decision on the pass to Scott. This is wonderful news for the Blue Jackets. Milano is becoming a force at both ends of the ice. This is what the team wanted when they sent him to Cleveland. He is responding well. When the time comes for Milano to return to Columbus, he will be a more well-rounded player. This is something the scoresheet doesn’t tell us. Bjorkstrand is also improving defensively. He’s active at both ends of the ice and uses his speed to disrupt the opposition and also start offensive rushes. The Monsters are a top-10 team in the AHL on defense. Star players like Milano and Bjorkstrand have helped the team in that aspect of their game. When it comes to evaluating them, looking at the stats is simply not good enough. You have to look at the 200-foot game, and the two have improved on the defensive end. They are developing quite nicely and are exactly where they need to be. They’re playing top minutes against the opposition’s best and doing a good job of it. When they eventually get the call, they will be ready to stay for good.